All you need is (Peace and) Love! Show the world you won't do the hate. With this set of seven, you might keep them all or pass them on to friends and loved ones. I begin each of these bejeweled peace signs by wrapping a steel ring with solid copper wire that has an enamel coating to retard oxidation. 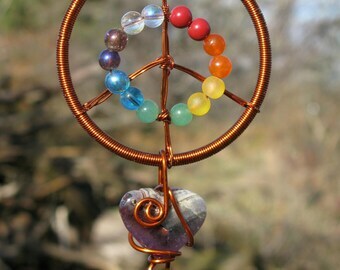 Circling the peace sign is a rainbow for unity and equality in a mix of glass and gemstone beads. The final touch is a carved and polished gemstone heart. Each of the colors of the rainbow corresponds to one of the seven basic chakras (meaning "wheel" in Sanskrit, so wheels of energy in the human aura). 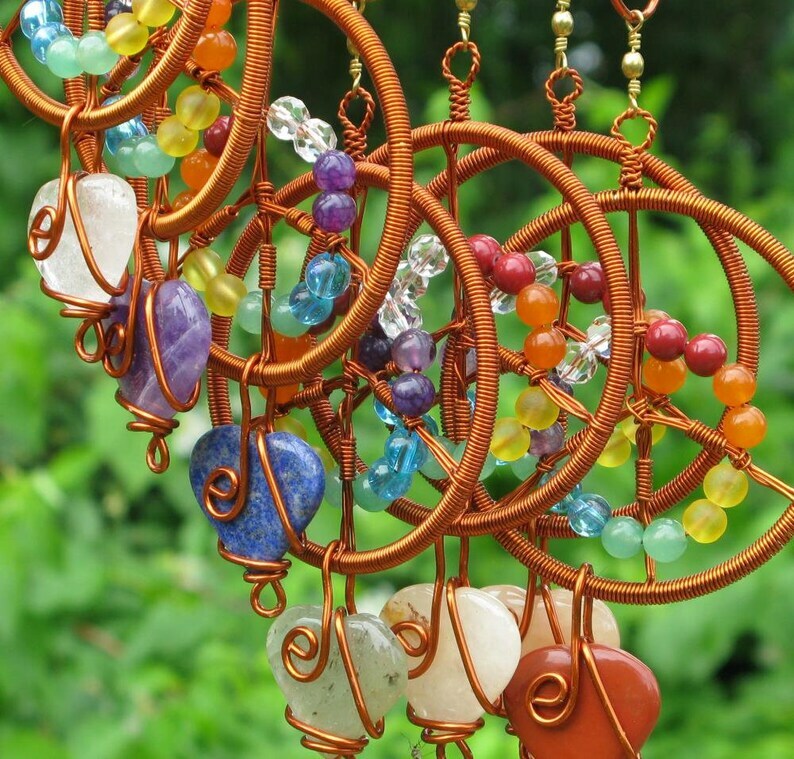 For an added touch of metaphysical mysticism, each little suncatcher features a gemstone heart made up of Red Jasper (energizing), Carnelian (releasing), Citrine (organizing), Green Aventurine (balancing), Lapis Lazuli (communicating), Banded Amethyst (integrating) or Crystal Quartz (clarifying). The symbolic meanings of the rainbow stretch from China to the Celts, from Christianity to Hinduism. Through the eyes of many cultures, the rainbow is seen to be iconic of Life, Hope, Divinity, Promise, Creation, Initiation, Potential, Provision, Harmony, Expansion, Ascension, Spirituality, Connection and Transformation. 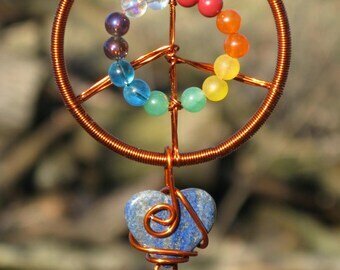 Overall width of each Peace and Love suncatcher is 3" and the length is 7.5". As gemstone hearts are carved from natural materials, the exact sizes and color intensities may vary from suncatcher to suncatcher. Each order consists of a set of seven suncatchers, is ready to ship and will be mailed Priority Mail within one business day of payment.